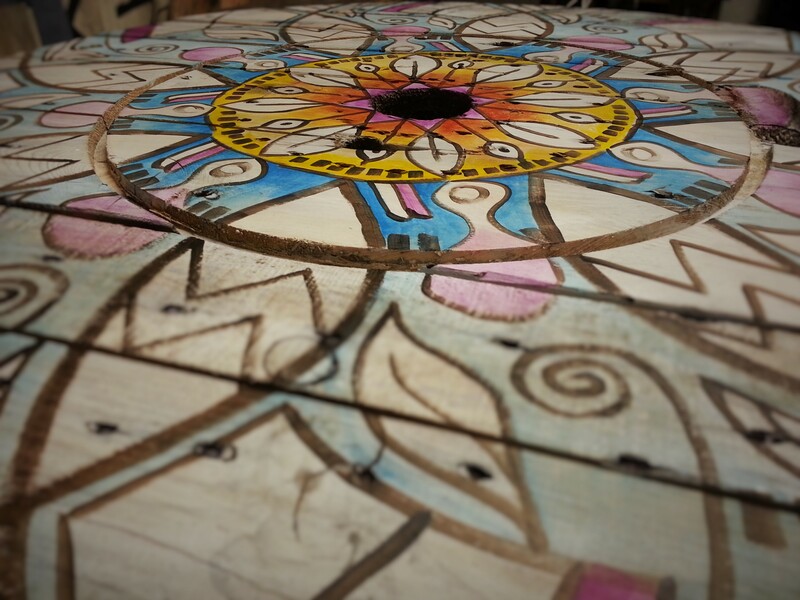 One side of an old, abandoned spool has become my personal mandala. It is scrubby and rough, porous and broken. Altogether perfect, actually. I am using it in a meditative practice of my own, letting the silence tell me what the next gesture, line or color will be. I love it. It is so relaxing to not have a plan other than the repetition around the circle. There are shapes that look like leaves, fishes, aliens, beakers, Charlie Brown’s sweater, a flower or axe heads, but none of them were planned. They came from the silence. Or the gesture before. I have two of these round spool ends, and they’ve been staring at me like two big googley eyes since the summer when I scavenged them from behind the hardware store. (Yes, I got permission.) I had a few ideas for them but they were too planned, too controlled, like everything else I do. This time, I wanted to do something the form suggested. A mandala is used in spiritual practice as a meditative device, and that is exactly what I am needing at this moment. No thinking, no planning, no sketches, no reference–just silence. There is no iconic division in the symbolism, no heaven or hell, no representation of the four seasons or my view of the universe; just the repetitive gesture and color around the circular form prompted by the silence in which I paint it. We don’t value silence like we used to, and I miss it. So these little breaks in the day when I go over to the studio and lay down a new color or tone are really precious. Magical, even. I’d offer to show you the finished product, but that isn’t the best part. The best part is the process–the mixing, the painting, the thinking, the silence. Beautiful, Kristin. Really, really beautiful.